It was decided, at the tender age of seven, that I was ready to be initiated into the musical life. So, one rainy Thursday afternoon, the accordion previously bourne by my two older brothers was ceremoniously passed down to me and off I went to Mr. Duffy’s music shop to begin my tuition. Mr. Duffy’s music shop is long gone and there is now nothing of its kind left in the world. Half of the establishment was made up of a tiny dark spartan front room, which was accessed from the street and which was evenly bisected by a tall wooden counter. This ‘shop area’ seemed devoid of any trace of musical paraphernalia but most customer requests could be readily filled by Mr. Duffy producing items from hidden cupboards and unseen drawers. A small door led from the shop to a private residence in behind and it was here that the music teacher entertained his students. The room was a small shabby/comfortable living space dominated by the spindly music stand, which stood facing the shop partition wall. Every week, I would stand facing this wall, my accordion harnessed around me, my sheet music in front of me, and I would play. I was, in all fairness, a very poor master of my instrument. Thankfully, the sheet music had helpful codes scribbled on it to help me see which button to press and whether to squeeze or extend the air box to achieve the required note. The accordion also boasted a most useful button at the left thumb for use when the box had no more ‘squeeze’ left in it. 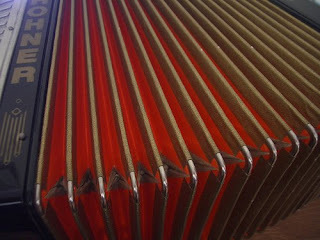 Upon pushing this button, the accordion could be pulled apart in an asthmatic gasp without any note issuing, to give some additional tolerance for any push-in notes which might follow. While I am sure the accordion teacher attended to his more worthy pupils with the greatest of care, he always used my hour as an opportunity to catch up on his housework. He wore a pair of eyeglasses of which one lens was enormously magnified. Occasionally he would leave off his tidying to peer over my shoulder, checking that I had not substituted his music with some post modernist, avant-guard score. Having satisfied itself that I was indeed attempting to play ‘The Toreadors March’, this Cyclops would withdraw back into its domestic routine, occasionally barking out an instruction or admonishing my chronic lack of practice. By far the most constant refrain heard during my hourly sessions was that of ‘Keep Playing’. I was much more interested in my master’s cleaning activities than in the latest tune and, as my interest peaked, so the music would whine and fade away. At this point I would hear the refrain ‘Keep Playing, Keep Playing’ and I would hit the ‘asthma button’, pull the accordion apart and plough boldly onward. One day, my teacher was attempting to light his fire. I could see out of the corner of my eye that he had sealed the front of the hearth with a sheet of newspaper and was on his knees at the grate blowing upwards. This was of considerable interest to me so the tune duly petered out. I was exhorted to "Keep Playing, Keep Playing" as Mr. Duffy retreated to a hidden back room in search of tinder. As I unceremoniously murdered ‘Believe me if all Those Endearing Young Charms’, a new event seared itself on my questing peripheral vision. The newspaper over the fire has caught alight and was solidly ablaze, throwing bright orange licks toward the low black ceiling above. "Excuse me?" I called out, "Excuse me?" "Keep Playing," was the distant reply, "whatever you do just Keep Playing". Thus, regardless of the fact the my teacher returned in good time to save the day, my abiding image from my years of accordion tutelage is one where I am cast as Nero, boldly accordioning away while home burned. One Thursday, I was collecting my accordion case from the hall when a kind parental hand was laid over mine and I was told that there would be no lesson today. My accordion teacher had died peacefully in his sleep. It might be judged a sad epitaph that I never again, after that day, picked up an accordion but really it is not. I am gifted with a good sense of rhythm and an uncanny memory for a tune, which I undoubtedly owe to my music teacher. There is a quotation which says that; "A gentleman is a man who can play the accordion but doesn't". There is some comfort in knowing that, in this one respect at least, I remain a gentleman. Ha ha ha, really Ken, you're a master storyteller. I enjoyed the light banter of the story so much. Your stories usually bring laughter to my day. In spite of the dismal circumstances in which the story occurred, you have a way of allowing the reader not to see this, but instead perceive the humor in that particular situation - and that is a rare talent. Where oh where is that gentlemen and accordions quote from? Ah, Ken, you've just allowed me to run the gamut of emotions here with this. Though never did I (lol, as so many like to say), I was chortling on the inside with this particular line: "Having satisfied itself that I was indeed attempting to play ‘The Toreadors March’, this Cyclops would withdraw back into its domestic routine..."
The thought of you attempting Bizet on the accordion is enough to break me, but the Cyclopian reference was too much! Loved it! Oh, and the Nero/home bit was brilliant too. More than this, though, I really enjoyed the way you ended the story with some real poignancy and charm. Do they have a saying for mediocrity in piano (forte)? I love this. I cannot dispel the image of the young Kenneth, accordion strapped to chest, nervously cranking out a tune while the house is destroyed. Nero indeed. Brilliant stuff. Nice read. Did you that the first instrument Benny Anderson, of ABBA, learned to play was the Accordion? It was used to for all sorts of old Swedish folk melodies and it got Benny interested in Keyboards. You might say that the opening keyboard flourish of Dancing Queen has its roots in Benny's Accordion playing. Yeah, yeah, I know. More trivia in my brain than any sane person would believe. One of the most surprising events in my life happened at the tender age of thirteen when my father took his redundancy pay and – unbidden by me I have to say – bought me the most expensive electronic organ in the shop. I didn't get lessons. Being a bright bugger I taught myself to play and it was only a matter of weeks later I was writing my own tunes. When I got to fifteen my dad did pay for composition lessons from an old fellow I only knew as a door-to-door salesman (soap of all things). His wife had been a concert pianist in her day but, although always exceptionally nice to me, she never took to do with the lesson apart from one day. (They were both from Lancashire by the way – lovely accents). I'd brought this piece and was doing my best to hammer it out on his piano but I was struggling. His wife came in and asked if she could give it a go which she did and then she began improvising around what I'd written, this dumpy old woman who'd you pass on the street without giving her a second glace. I can't remember either of their names now. She always wore little crocheted hats that looked like a flat tea cosy – I've never seen anything like them since – but I'll never forget her coming to life at that keyboard. And no sooner had she finished transforming my sad little piece into a work of art she hopped off the stool and went off to make the tea. perhaps someday we can play a duet together. I too, took accordion lessons, I no longer play and my teacher is grateful for that I am sure. Ah the childhood trauma..I mean drama, of music lessons. Mine was piano mixed with eccentric relatives. I enjoyed your "learning process". It brought back such vivid memories of mine, you helped inspire my "Father's Day" blog today. The 'gentlemen and accordions' quote is by that great wit A.N.On. I don't agree with it - we have some marvellous 'box' players here in Mayo, I just don't happen to be one of them. We did play things like Bizet and Strauss but lots of Trad music too. It was quite the eclectic mix. Once again I read one of your true life stories and smile to myself. You have a gift of setting the scene and making the reader feel part of the story. Plenty of us around the world are unsuccessful musicians. But there might be more to your teacher's lament of "No matter what, just keep playing"? Seems a good life lesson, many things happen in life, but no matter what, you have to keep playing... Thanks again Ken for a great piece of prose, and I invite you to submit it to our contest on PlotDog Press, we'd love to share your work. Thanks for using my picture. And also for the entertaining story! I loved this story...I too felt as if I were right there with you. My heart get very big, my shoulders drooped, and my eyes got the misties at the ending. Thank You for sharing this story Ken, you surely are a "gentleman" in every sense of the word.